Democrats "thrilled." BuzzFeed reports that Republicans were split on the move, while Democrats were "thrilled," and a little puzzled by the president's timing. "It’s hard to figure out," said Democratic Sen. Chris Murphy. "They literally are teeing this up as an issue for Democrats for the next year and a half. They're not even making a laughable attempt to save the most popular parts of the Affordable Care Act." GOP divisions. President Trump said Tuesday that the GOP will soon be known as "the party of health care," but the party is split between conservatives eager to abolish ObamaCare and moderate lawmakers who worry about how voters will react, the Wall Street Journal reports. "You’ve got to have a framework for pre-existing conditions. You can't just wipe everything away and have nothing there," says Rep. Don Bacon, who represents a swing district in Nebraska. Election preview. While the case is unlikely to be resolved in the near future, the Trump administration's move is likely to energize Democratic candidates gearing up for next year's election. 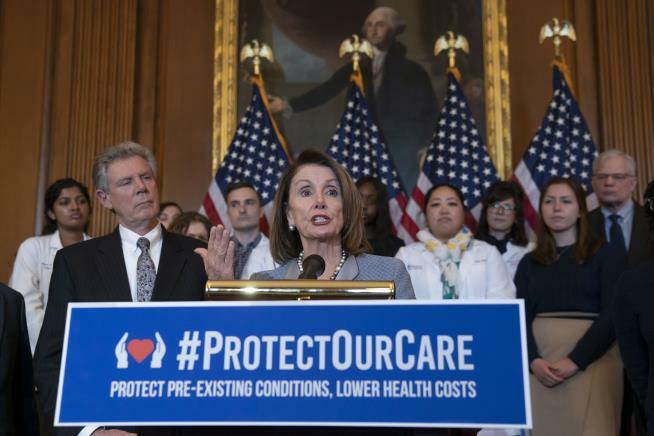 "The move sets up the possibility that hundreds of thousands of Americans could lose their health insurance—perhaps around the time of the 2020 presidential election—with the Trump administration part of the reason why," notes Anthony Zurcher at the BBC. A gift for Nancy Pelosi. Trump had handed his opponents the issue that "more than any other, won the House back for the Democrats in last year’s midterm elections," writes Karen Tumulty at the Washington Post. If Trump is playing hardball to get Democrats to the negotiating table, he may have miscalculated as badly as when he shut down the government, she writes. "Tuesday was Pelosi’s birthday," she writes. "And Trump just handed her the best gift she could have hoped for." The biggest issue with Obamacare is the cost for the insured. For example, my wife is 57. IF she wanted Obamacare TODAY and chose just a simple Silver plan with a $3K ded it is $1400 mo. With an $8K Ded the premium is about $840 mo. So for those hating Trump for this-tell me, how will the average person afford this? No she CAN NOT get help with the premiums-she makes too much-anything over about $10 hr wipes any government help with premiums. $1400 mo is 3 weeks pay for her. Makes sense doesn't it. So tell us again why Obamacare should stay? If your state DOES NOT have expanded Medicaid and you aren't employed you get NOTHING-can't get Obamacare, Medicaid or anything-you are just out of luck. *sigh* Here we go again. The GOP has been trying to kill me for 10 years. I thought they'd finally lost interest but I guess not. thrilled our government is so corrupt you can get away with treason? IDTS no branch of American governments laws are worth the paper they are printed on.